Alexander Hamilton (1757-1804) was an illegitimate West Indian emigrant who became the first U.S. Secretary of the Treasury. 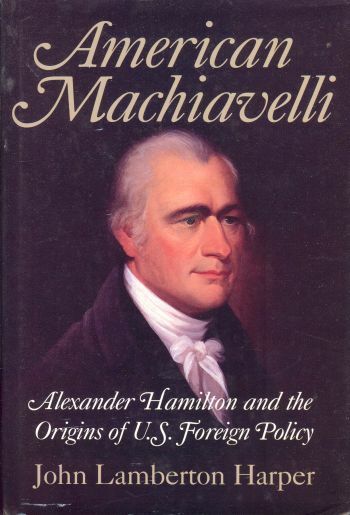 American Machiavelli focuses on Hamilton's controversial activities as foreign policy adviser and aspiring military leader. In the first major study of his foreign policy role in 30 years, John Lamberton Harper describes a decade of bitter division over the role of the Federal government in the economy during the 1790s and draws parallels between Hamilton and the sixteenth century Italian political adviser, Niccolo Machiavelli. Harper provides an original and highly readable account of Hamiltonas famous clashes with Thomas Jefferson and John Adams, and his key role in defining the U.S. national security strategy. John Lamberton Harper is Professor of Foreign Policy and European Studies at the Johns Hopkins University Bologna Center. He is the author of America and the Reconstruction of Italy, 1945-1948 (Cambridge 1986), winner of the 1987 Marraro Prize from the Society for Italian Historical Studies, and American Visions of Europe: Franklin D. Roosevelt, George F. Kennan, and Dean G. Asheson (Cambridge 1994), winner of the 1995 Robert Ferrell Prize from the Society of Historians of American Foreign Relations. His articles and reviews have appeared in numerous publications, including The American Historical Review, The Journal of American History, The Times Literary Supplement and Foreign Affairs. Very lightly read book with no writing or other marking, No dogears, tears, or other defacements. Slight wear to dustjacket which has a price sticker on back from U of A Bookstore.